I had an amazing week this week! I watched as two dreams I voiced years ago came true. I put it out there into the universe, spoke it and watched as it came back to me. One was huge with possibly big consequences, the other was smaller and more of a personal triumph. Both of these things came about the week of my birthday, so Happy Birthday to me. Birthday packages come in all shapes and sizes. Nine years ago while Bryant was still in the ICU and we were given little hope that he would pull out of his coma or live a productive life, we were scheming otherwise. Steve and I talked and planned that one-day Bryant would overcome and become a motivational speaker. I know that sounds crazy, but we did, we really did talk and pray about it. What we didn’t know is that his younger brother would take that walk with him. This week we received a double blessing, both Bryant and James spoke to a group of athletes at a local high school. They have an unbelievable story and want to tell young people, how your choices today, right now as a teenager could change your entire life, and possibly that of your children. This is a small beginning to what I believe in my heart will become so much more. My mind goes back to my favorite movie, It’s a Wonderful Life. You never really know how your actions may impact another person’s life. I believe that they have put their feet onto the pathway of changing many outcomes, even though they may never know it. Well done sons, well done. This is a great example of turning victim to victor! So if you know of a speaking venue for these two young men, please contact me via our web site. 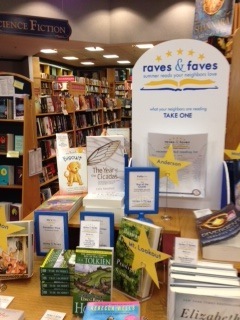 The other triumph was that my book, The Year of the Cicadas made it to the Summer reading table of Rave & Faves by local readers at Joseph-Beth Bookseller. I used to walk through that very bookstore and dream about writing a book and one day and having my book placed on that very table. I must admit, I am rather proud. God has already prepared the hearts and minds of the people who are to receive our message. In my own way, I too will be changing a life when someone reads our very personal story of truth and redemption. I have had years of work and sleepless nights between dreaming those dreams and the reality, but oh the victory is so sweet. Happy Birthday to me, this has been an amazing week so far! Sometimes I wonder why I put our personal account out there for the world to read. Sometimes I wonder what my family, friends and neighbors must think of me. For those of you who have not had the benefit of having us speak at one of your functions you really don’t know why. Here is the reason, when I was in the ER with my son, I heard a voice say “This is the story you have been waiting to write.” When I was a young girl I always wrote, day and night if I wasn’t writing I was reading. Around the age of thirteen I put my writing away with my childhood things, always knowing that if the right story came along, I may one day pick up my number two pencil once again. Then the voice said once again, “Pay attention this is the story you have been waiting to write, I gave you the talent.” My response was, “Then it better have a good ending or I’m not going to write it.” Well our story has a phenomenal ending. I owed a debt and needed to fulfill the promise I made that day standing in the ER praying for a chance for my son’s survival. It took me a lot of years to complete this journey, but our story is out there. It is a raw and some times an unkind look at our lives, however it is the unvarnished truth seen through my eyes. I can only hope that my dysfunctions and my reactions and lessons can help just one person and then the journey will all be worth it. One of the best things about having written my book, The Year of the Cicadas is reading the reviews. They have been like one great big, wonderful hug. I have trouble accepting help, accepting compliments and many times I simply gloss over these reviews, and think ohhh, isn’t that nice? On occasion, I stop, sit down with a cup of steaming tea and actually allow myself to read and absorb these reviews, and let it sink in. Then I am overwhelmed with emotion. I received a copy of this book through the Goodreads’ First Read Giveaway. Every once in a while, if you’re fortunate enough, a book comes along that changes your life forever. I’ve had only a handful in my lifetime, and I am excited to add “The Year of the Cicadas” to the list. I urge you to read this book. I know it will stay with me for a long time. When I read words like this, I know I have done the right thing, and that voice in the ER that was urging me to tell the story had a plan to use our journey to help others. Thank you to my readers, you have helped to heal our family and to heal me. I have spent the lovely months of June and July with my grandchildren. I have heard it said that you can’t push through on your forward golf swing, unless you bring the club back to rest behind your head. Those two months were my backswing. I am hoping for a long powerful drive this Holiday Season. Although it is only the first of August, work has now begun on my marketing campaign for the upcoming holiday season. Last year our book was barely out of the box before Christmas was upon us. I hear from the professionals that this is a big time for book sales. Please keep our book in mind when planning your gifts this Holiday Season. The month has started out with a bang; I learned that The Year of the Cicadas has been accepted in the book festival, Books By The Banks in Cincinnati, Ohio, October 12, 2013. I am really excited about this. Unless you have recently tried to get a self-published book into a book festival, you cannot begin to understand how monumental this is! Most professionals in the business say they have seen too many poorly written and bound books to give self-published books a second glance. They assume that if the book were a quality work, a publisher would have picked it up. Things are changing in the publishing world and there are many of us “Indie” authors out there with enough savvy and drive to compete in their traditional publishing world. If you have read my book, The Year of the Cicadas you are familiar with just how much drive I have. Many new blog/websites have popped up over the past six months that feature self-published books, I am signing up for as many as possible. We are also taking our book on a National Campaign by working with a publicist who will hopefully take our book to the next level. I have no idea where this is going, or how to get there, but I am enjoying the ride. We were on our way for a little three- day weekend getaway. It is getting close to lunchtime and we are ready for a little stop. Pulling off of the interstate we find ourselves in a small mid-western town, a perfect throwback to the 1960’s. We look for a coffee shop, or outdoor café, no such luck. Then we spot the sign, a small café selling local produce, and homemade sandwiches. Tables and umbrellas invite you out onto the large patio. We look once, and then twice…our eyes are not deceiving us, it’s the Public Library. The moment I walk through the door…memories of lazy summer afternoons spent reading a book both as a child and with my own children flood back to me. As a girl I could check out eight books at a time with my own library card. I always checked out the max, and walked home many miles with my huge stack of books, hardly tall enough to see over the top. I didn’t mind, I knew that many hours of adventure and learning were waiting for me to devour, sometimes I would even try to read a book while walking home! Don’t try this, it doesn’t work, patience is something you learn…not something you are born with! Standing in the entrance I breathe in the familiar scent, the smell of lots and lots of books, and something else, what is it? This is when I remember the café. I look around and there it is prominently placed at the entrance to the library, an indoor fenced off area with tables and chairs, and people sitting around sipping a cup of coffee, soup and sandwich, or homemade no-bake cookies, yet another staple from my childhood, reading a library book! Overstuffed chairs are placed throughout the library to offer comfort and ease as you thumb through your old or new favorite book. No wonder Barnes & Noble are struggling I think. This public library in this small town has converted their model to duplicate the merchandising giant. Pure genius! I wander through the library, same old paneling, same shelves, same Dewey-decimal system, only no card catalogues…that part only lives on in my memory. Everything else is the same as our library at home, except the place is packed. I have not been frequenting our local library branch lately, maybe they are doing the same thing? I make a mental note to check it out. While eating my local fare, I looked over at the prominently displayed books right outside of the café, all about organic gardening, and book after book that make my fingers itch to go check them out. Then I remember that I am simply a visitor to their branch of the library and that I cannot take these books home. You won’t find a copy of The Year of the Cicadas in your local library branch yet, please ask your librarian to order a copy, they can make it happen, give them a little nudge for me. I hope that this summer finds you enjoying some summer reading, and making lots and lots of memories while doing so. An hour spent in the garden…. On my author bio, for my book The Year of the Cicadas, I have stated that I am an avid gardener, and I am. I love gardening. I have an engraved rock in my garden that says “An hour spent in the garden puts life’s problems into perspective”. It does, it really does. Few things make me happier than spending time in my garden. The only thing better is spending time in my garden with my family a perfect “ten” for me. I would like to share a little garden wisdom with you. 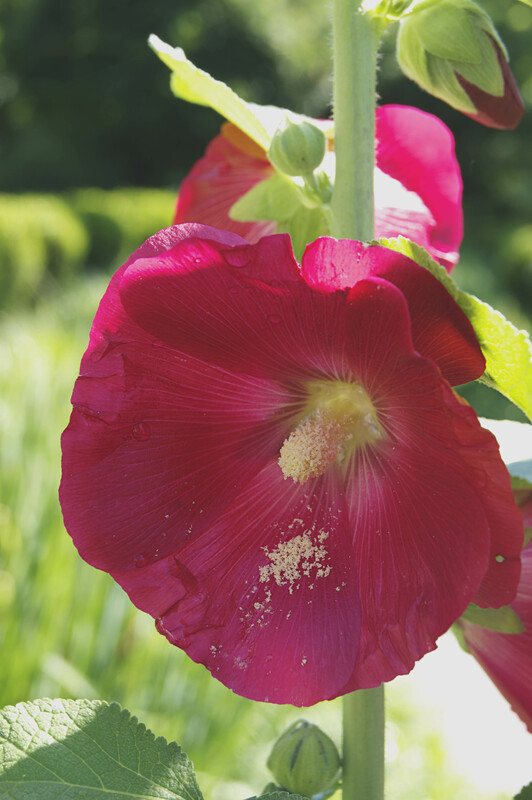 It is about Alcea Rosea otherwise known as Hollyhocks. I love hollyhocks. 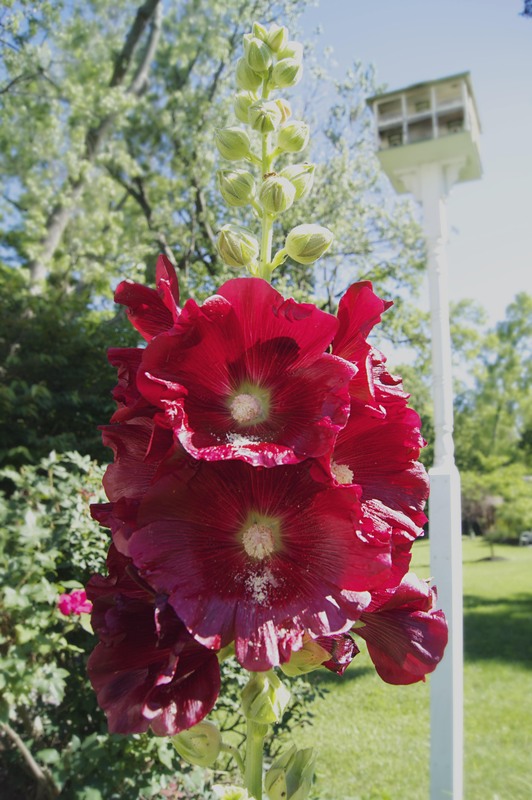 I love all things old, and a Hollyhock brings back memories from my childhood of Hollyhocks growing next to the mailbox. I remember them scattered among the fence lines on the cracked and broken sidewalks. My sisters and I would pick them and pretend that they were beautiful doll dresses, with a little imagination they could be so many different things….. I am a perennial gardener and have been for almost thirty years, so I know a thing or two about perennials. I have been around so long, I remember when perennials starting becoming popular and a bitter dispute broke out between two neighbors. One claimed that perennials were weeds, while the other said they were not. Perennials had been officially classified as weeds and the beautiful garden lost the court battle and had to be plowed under, such a shame. How times change. It is always from the perspective that one is looking from. My gardens have gotten to be quite extensive, but so have life’s problems for me. Whenever I get sad, frustrated, or just need to talk to God, I head to the garden for some perspective. I never see the problem quite the same by the time I head back into the house. Ooooh the lessons I have learned from my garden. This is what I have discovered about Hollyhocks, remember those broken rocks along the sidewalk? Well, Hollyhocks love to grow under rocks. I don’t know if they like the warmth or if it offers protection, but your Hollyhock roots will do better if you place a rock next to them. We all like a little protection during the cold. They do not like to be crowded. 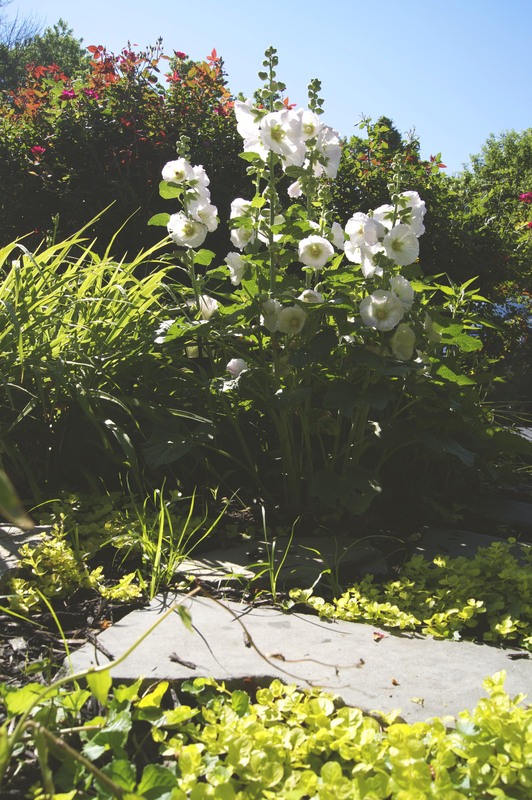 When the perennials start to crowd too close around them, preventing air circulation, they become sickly and develop a “rust” fungus. I also get a little sickly when I am over crowded and can’t get fresh air. To fight the fungus you can use an organic mixture of corn meal and powdered milk, but it only works so-so. If you really want to beat back the fungus use a systemic fungicide on them, preferably early in the spring and then as necessary. A little mixture of homeopathy and medication is always a good thing. It is also important to pick off the infected leaves as the fungus will spread with the rain or watering to other Hollyhocks. You must be careful in this endeavor. If you take too many leaves off the plant cannot photosynthesize and will die. It is a careful dance of removing leaves and leaving leaves. Do not put these infected leaves into your compost pile, throw them away! They are contagious to baby Hollyhocks. It is always best to catch these things early and take care of them quickly. 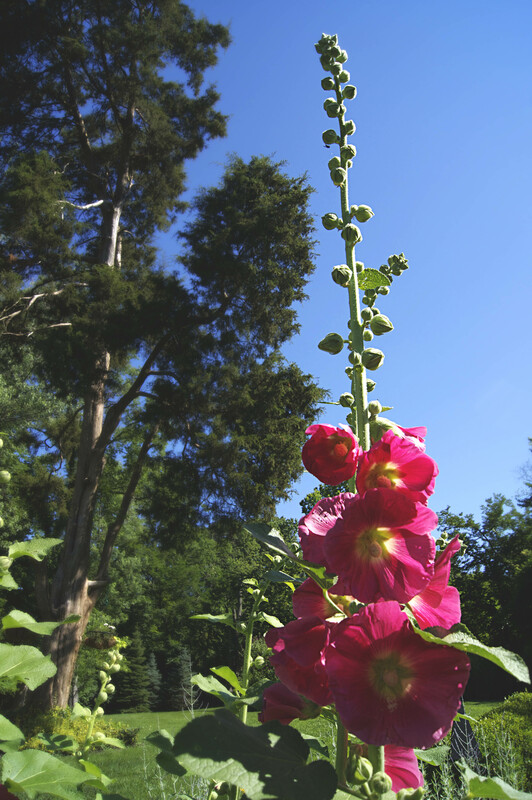 Hollyhocks are not official perennials, they are actually biennials they reseed so readily they will fool you. 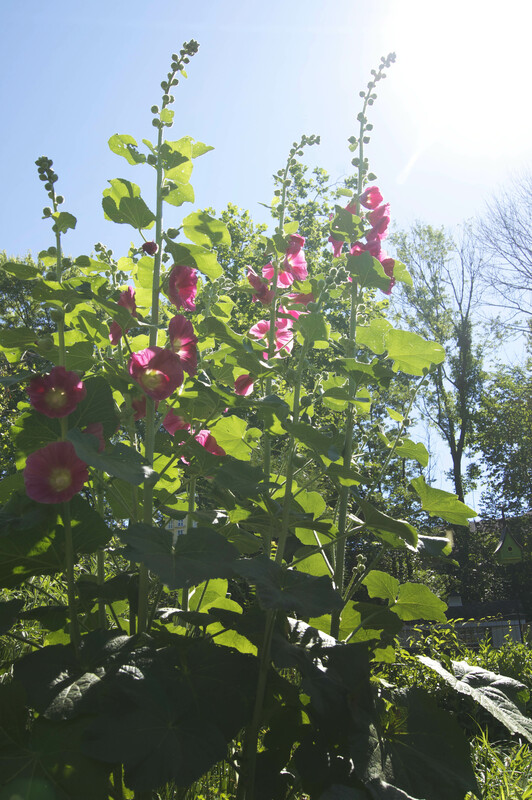 There are many stands of Hollyhocks that have been around for many years, and if protected they can survive for a long, long time. The roots on Hollyhocks go deep. You could dig an old one out, and be surprised when it continues to grow back. In life, as with Hollyhocks old habits, like old roots will pop back up when you least expect them. 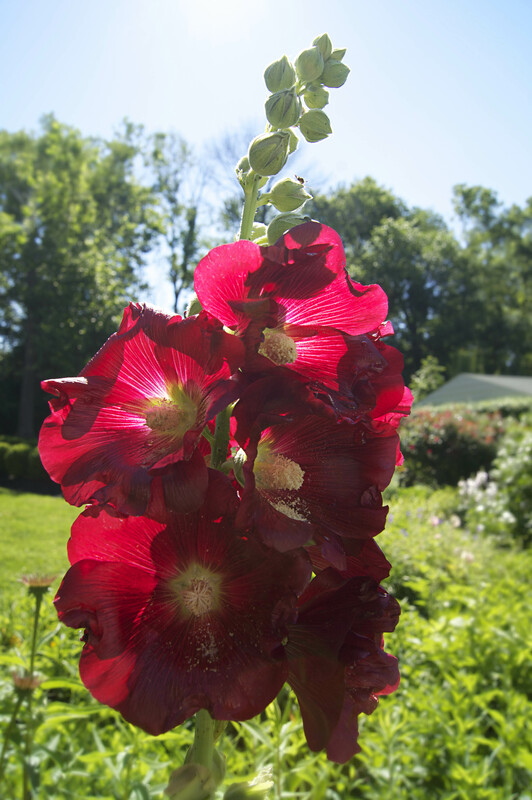 Hollyhocks can go along for years and give you no problems at all, and then someone shares a new plant with you and unknown to everyone it has a virus, and the virus spreads to all of the other Hollyhocks. Nothing is more beautiful than a seven foot tall Hollyhock standing firm in the wind, covered with beautiful blooms that look like doll dresses, except a Hollyhock standing seven foot tall with beautiful blooms that look like doll dresses, and you know that you have cared for it, nurtured it, loved it and helped it to reproduce so that the species will continue. My garden has taught me so much about life, and an hour spent in the garden does put life’s problems into perspective. Happy Gardening. I am often asked as an Independent writer/publisher, “How are your book sales going?” This is a mixed question, and an easy one and a complex one. Do you mean how are my book sales going via printed copies or print on demand books? How are my book sales going out of the trunk of my car, or online? By online do you mean Amazon, or my website www.TheYearoftheCicadas.com? Perhaps you meant, Kindle, Nook, Kobo or perhaps I-book. Do you know that the average self-published book only sells 250 copies? “REALLY?” you would probably say. That is hard to believe, but that is the national average last time I checked. Although all of the avenues listed above all produce sales, book clubs have been our greatest ally in the pursuit of book sales. “REALLY?” you would probably say once again. Yes, The Year of the Cicadas is a book that does best by “word of mouth.” One referral to another, or in our case, one book club to another. Steve, Bryant, James and I, sometimes all of us, sometimes only me, have been crisscrossing the country attending book clubs, whenever we can. Each book club is as diverse as you can imagine. Sometimes they are a long-standing book club like the “Sweet Potato Queens” or the “Flabulous Ladies and Books, aka FLABS, with many attendees, sometimes they are newly formed groups that got together to read our book and have us visit. Many times they are a mixture of both, the book club and a group of friends scattered amongst them. They may be an “all girls club”, or couples. We may be gathered around a table of food, or simply a glass of wine. It doesn’t matter if it is in a home, coffee shop, or place of business, the experience is always the same. We have all been brought together by a story of struggle, love and redemption. This is something that most people can relate to. One of my readers said it best, “We all face a cliff in our lives, it may not be a real cliff, but a cliff of depression, addiction, failing marriage, trauma, and on and on..,” We share our story, and they share a bit of theirs. Everyone reads a different story when they read our book, it depends on where they are in their lives when they read our story. 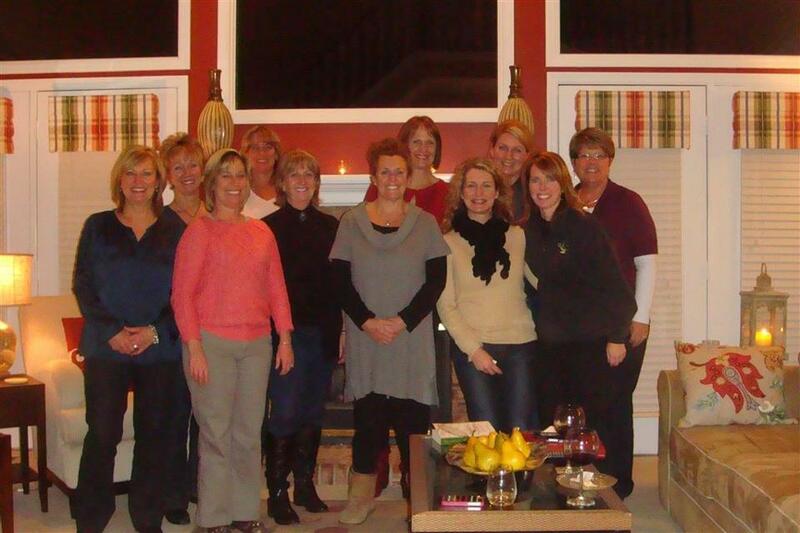 Friday I received a message from a friend who has formed a “book club” of forty friends. She asked if I bring over a case of books? Today I received a message from a book club attendee from last week, her friend wants to get five more books, could she still get the book club rate? Another book club reader passed her book to a church friend and they want to discuss getting some people together to talk about our book, and this is how it goes….. Sometimes our book signings have been wildly successful, sometimes they have been a flop, but our book clubs have never failed to amaze us, and to fill us with love, and wonderment. It is difficult for us to fall asleep at night after a book club. We are filled with a warm buzzing glow from all of your love and insights. So once again, thank you to all of you for the wonderful gatherings, and here’s to many more. Is Self Publishing vs. Traditional Publishing a little like Duck Dynasty vs. Downton Abbey? You write your book, you make a decision at the time to self-publish or go the traditional publishing route, you have your book in hand, or perhaps in pdf version only, these days you don’t really need to have a book in hand….and your done. These days nothing is as it used to be in the publishing world, or on television. I love Downton Abbey, but I also like a little Duck Dynasty now and then as well. I have always had a strong independent streak to me, as my son said to me the other day, “Mom you just keep reinventing yourself. Sometimes your successful at what you do, sometimes you’re not, but you just keep taking on new projects.” Wow, I liked how that sounded. I am creative and I believe you can accomplish what you set your mind to, if you follow your heart, and a good book or two on how to accomplish your dream. Ha ha…that is where it get’s complicated. If you buy a book on how to self-publish, or traditionally publish your book, by the time your book is written the book your purchased to educate you on “how to do it” is obsolete. It sounds complicated, and it is. I feel like the Grandmother in Downton Abbey, after World War I the entire Victorian age came to a sudden end. I decided to self-publish. This was a “God” thing for me. I wrote my very personal story, The Year of the Cicadas as a thank you to God for giving me back my son, and helping our family to turn tragedy into triumph. Sure it was hard to put all of our personal stuff out there, but I felt that perhaps our story could help someone else. After all, the family on Duck Dynasty put their personal stuff out there every week and they survive. Besides, I couldn’t trust that anyone else would have the drive that I have to push my book, it’s that independent streak in me….or is it part of me that doesn’t want to give up control? The book had only been out three months when an agent from New York contacted me and wanted to represent my book. Wow, this was something to think about. The old parable about the man caught in a flood, he knew God would save him…so he sat on the roof of his house to wait for God. A rowboat, then a power-boat and finally a helicopter come by and he refuses all three, waiting for God to rescue him. When he drowns he asks God why he didn’t save him, God answers, “I sent a rowboat, a powerboat and a helicopter, what else did you want? Was this agent my rowboat? Hmmm maybe I should learn to give up control. I now had doubts. My ego has been stroked and I am feeling all Victorian. I spend a month writing up a sixty-page proposal, editing and re-editing it to meet with the agent’s expectations. My proposal’s all about why a publisher would want to get on board and represent my book, all the while I am really busy promoting my book and by many standards selling quite a few books. One thing after another comes up for both the agent and myself and time goes by, suddenly we have now spent three months preparing, and finally the proposal is off to the first publisher. I feel like Lady Edith when she is asked to be a reporter. This is a small publishing house that I have certainly never heard of, and I also don’t recognize any of the books that the publisher represents, but let’s remember I know nothing about the magical world of traditional publishing. It would be like Lady Downton visiting with Uncle Cy. Some things simply don’t mix well. A response comes back with both positives and negatives, they need even more information before they can decide. They read my book, they ask more questions, especially what have I done to promote my book and what else do I have in the works, and “what is my budget for promoting my book.” I am confused at this point, I thought if I went with a publishing house they would promote my book and they would pay for the promotion. I have been expecting a proposal from them. I am feeling less Downton Abbey and more Duck Dynasty with the passing of each day. The response comes back, they like my voice, and are amazed at the organic movement toward my writing. If I want their name on my book, they will require a complete re-work of my book. A very deep edit, with many changes, I need time to think about this. I don’t mind working hard, and if this is needed, and will get our story into the hands of more people, then great. I finally agree. After all, I have my copy for my grandchildren. But, I have this nagging feeling…what they had referred to as the “organic” movement of my book, or the growing fan base of my down to earth style of writing, could it be compromised by a complete re-work of my book? I must ask this question, I have doubts. My book could use some rework, I agree, but there is something to it that pulls at the heart-strings. I certainly am not savvy enough to know what it is about The Year of the Cicadas that spurs a reader to gather up forty people simply to read our book and discuss it! Could a deep edit/re-write hurt that organic movement? Do they know what it is about my book that causes such a reaction? Once I ask this question, things change quickly. Overnight a decision is made that I am to “independent.” That The Year of the Cicadas is doing well, and that perhaps I should continue on the course I am on. I believe what is happening in the world of publishing is the same thing that has happened on television, we all say we want Downton Abbey and Masterpiece Theatre, but a large base of people want the real story and watch reality television, or Duck Dynasty. Maybe that’s what my book is: The Reality Book. Maybe that is what they mean by “organic” movement. So much for my foray into the world of traditional publishing, I agree I am way too independent. Back to promoting my book, my way…one person, one book at a time. Blogging is a different kind of animal. Not being born into the computer age and being introduced to “Social Media” in my fifties, I have been slow to grasp the power of social media. It can consume you and your time. I thought I was much more comfortable out in the garden or baking, but am I really these days? I have now spent three years at my computer, writing, rewriting and promoting The Year of the Cicadas. If I think of all of the hours that I spend, Facebooking, Tweeting, blogging, Goodreading, updating author profiles, contacting media and securing book events perhaps I am the person who is not accepting her new “norm.” The question is: What is social these days? I enjoy sharing this book adventure with my readers and promising writers who are curious how an Independent book writer and self-publisher goes about promoting their book. There are many opportunities out there these days to stay in contact, but it is equally important to take some down time. I was reminded the other day, that you cannot stay in a perpetual state of motion. In order to execute a golf swing you must first bring the club back to a state of rest to get power behind the forward swing. The book world has you on a time crunch. The most important time for your newly published book is the first six months. I have been chasing my tail for the past six months trying to do it all at once. Happy six-month release to my book this June. I am going to breathe, bake, garden, and play this summer. This is the last month of my six-month run and I have a book event once a week this month. We end our first six months on the anniversary of Bryant’s fall at a book signing, which is so appropriate. To view our upcoming events, please click here. My garden and grandchildren are calling to me. Time for me to regenerate and put my hands into the earth and around squiggly little bodies. Take some time this summer to plug back into what the creator is telling you. Steve and I were back on the road again, this time to familiar roads, memories, extended family and friends. 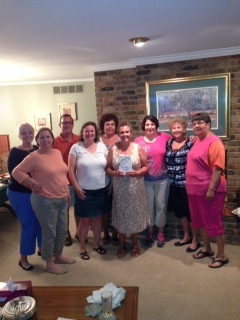 We travelled to St. Louis, Missouri to hold our first official “book store” book signing, for The Year of the Cicadas. I was a little nervous, I am sure it is because I was not “in charge.” The bookstore manager was in charge and I was a little in the dark about how it would be going down. Our other book signing events have been at unusual places, creative spaces and have been a lot of fun. As an independent writer and self publisher, you get creative and go with it. In my mind, this book signing will be all stuffy and professional. The moment I saw the St. Louis Arch, I felt a pang of homesickness. This is the place where seven very crucial years of my children’s development happened. We moved here when James was only eighteen months old and Paul was seven, with Elizabeth and Bryant scattered in the middle of their siblings. This is where my children learned how to throw baseballs, kick soccer balls, ride horses, and drive four-wheelers. We spent countless hours at the zoo and the science center here. Everywhere I looked there was another vision of my children running and chasing each other. Their laughter and smiles locked into my memory banks. I wanted to reach out and touch them as youngsters just one more time….just for a day, or maybe a week. Life doesn’t work that way, they are now the parents, and I am the grandparent. It is my grandchildren running, throwing balls chasing and laughing with each other. I should not have been nervous, the “official bookstore book signing” was not a big deal at all. It was wonderful to look out and see the love and support in that room. Children who had grown up with my children were there and my children’s beloved Uncle, who chased them through the barn and woods while playing hide-n-seek. A friend or two of Steve’s from his former work years here showed up as well. The life-long friend who was with Steve and I on our first date thirty-three plus years ago was even there. As I looked out at this crowd of love, we quickly concluded the book signing, and took the party over to a local pub, visiting throughout the evening. We spent the next day driving by our old little horse farm. Suburbia has found it and subdivisions abound all around it now, but there was a pang in my chest at its sight and it pulled on my heart-strings. We visited with the young man, Grant Henry whom the book signing was in honor of. He is home now from the hospital. After his car accident, surgery and traumatic brain injury, he is sporting the same blue collar that Bryant wore. His parents look tired but hopeful…. the last month has taken a toll. Their energy will come back, their son will heal, but life will never be quite the same for them. The Robert Frost quote, “The only way out is through” now has a new meaning, for they have come through, and will continue to go through for a while yet. So many emotions, so many memories, so much love. Driving through town and heading toward home we stopped by the St. Louis Botanical Garden, a perfect ending to our emotional weekend. This is where my passion for gardening took off. Walking through these beautiful gardens twenty-seven years ago, I knew I wanted to leave a beautiful garden behind when I pass on. The year has turned, and once again it is Spring. My world is covered in that new spring green, proof that the circle of life continues. I leave these gardens behind, along with the memories that I hold dear to my heart, back to my yellow farmhouse with the green roof, to my gardens, and to my grandchildren. A very dear friend of mine has been suffering, she has been tested, but throughout it all she has remained positive….for her son. On March 14 her sixteen-year old son was on his way to weight training at his high school, he was running a little late. Hurrying down the low traffic road something happened, no one will probably ever know for sure. He went off of the road at a high speed. Was he avoiding another car, a deer, or did he look down at his phone? It doesn’t really matter, it could have been anything. His car went down the embankment into a culvert, when he overcorrected to get it back onto the road, at the speed he was going it rocketed his car eleven feet into the air, clipping a telephone pole midair crumpling the car back onto the road. He was taken to the local hospital and then airlifted to St. Louis Children’s Hospital. In a moment your entire world can change. Steve and I were on our way home from our Atlanta Georgia book event. We were exactly at the crossroads when the call came in and we took the next exit and headed to St. Louis, praying for this wonderful family. Bryant and James jumped into their cars to be by their side as well. TBI’s do not discriminate, they can happen to anyone at anytime. This was the first time that it has happened to someone else that I love, since our son’s accident. The five-hour drive was difficult for us, on many different levels. This young man is the nephew of the two brothers “from St. Louis” that I reference in The Year of the Cicadas. They drove across the country to be by our side when Bryant had his accident. We think of them as an extension of our own family, this is personal. I prayed that I could be of some help, but I knew that just being there was important. When we arrived and the mother fell into my arms crying and my heart broke for her. Steve and I know the uncertainty that they were facing, the many decisions, and the helplessness of it all. Their experience was different than ours, but the emotions were the same. In the few days that we stayed, we prepared them for what was to come, the weight loss, the possible outcomes, how to be an advocate for their child who cannot speak for himself right now. We remind them that this is a marathon, not a foot race, and that they need to take care of themselves so they can be there for their son when he wakes up. He will need them to be healthy and sharp witted. Children’s hospital was an amazing place. Here they treat the “family” of the accident as well. They have lockers for their belongings, shower facilities, tables and chairs in the waiting room, you could even have your meals brought in by the kitchen staff. It is a “children’s” neurological ICU and they expect parents to be there. Our son was twenty-one, and they expected us to not be there. Isn’t every accident victim someone’s child? We found this facility to be humane and I was impressed and knew that this family that I love, was in good hands. The rewarding part for me was that his mother had read The Year of the Cicadas, and she was prepared for what was to come! I wrote the book, hoping that it could help just one person who was in the same position that we were in, and she allowed me to accomplish that goal. I never thought that someone I loved would hear my words in her ears even when I wasn’t there. Writing and self-publishing this book has been a lot of work, time, money and effort and she helped me to realize that it was for a greater good. Baring my soul and telling the truth about my emotions and what we experienced helped to prepare her, and I am grateful for this. His wonderful mother is now learning the lesson of “receiving.” She has always been such a giver and sometimes you have to put your self aside and let other’s give to you. Friends and family feel so helpless in a situation like this and they want to do something, anything to help. One of the greatest loves is to allow someone else to love on you, but it’s not easy to do. Many of you are aware of this accident because of my Facebook posts. Thank you for your prayers, they have made a great difference. Grant is now in rehab, and he is recovering quickly. His brain injuries appear to be slight, but things will be different from now on for him and his family. You can go to his Facebook page, Prayers for Grant Henry if you want to know more about this amazing young-man and his family. Steve and I will be in St. Louis on April 19 at Left Bank Books on Euclid Ave at 7 p.m. We will be donating the proceeds of our book sales that day to “Team Grant.” We hope you can attend, or tell someone you know to attend, help us to spread the word. …………………………………………………………………………………………………………………………………………….Our marketing plan is driven by one person at a time, and you play an integral role in helping this book find it’s way into the hearts and the minds of the people it was written for.